In the midst of the referendum debate I would like to draw your attention to the European Art of the Silhouette. Every so often I am asked to appear as a guest speaker about silhouettes and their history. These engagements are a real joy for me and can make a welcome change from cutting. They give me a chance to share some of my research into my lost, but once-very-international art. I had assumed that the market for guest speakers on the art of the silhouette would occupy the tiniest of niches in a niche of the already niche market for silhouettes! Yet recent events have got me wondering… Reactions to both my book and the film indicate that silhouettes touch a deep nerve in all of us. They possess a surprising universality which seems far from niche. Everybody can find themselves surprised and delighted by a simple silhouette. I am open to suggestions about the kind of events at which a guest speaker on silhouettes might work. Past clients include a WI dinner, various art and literary societies and (rather surprisingly) a family party. The video shows sequences from a talk we staged in my studio: “From Shadowgraph screens to Portrait Machines” during the making of the film. I see this working at a wide range of dinners, conferences, cruises and other events. 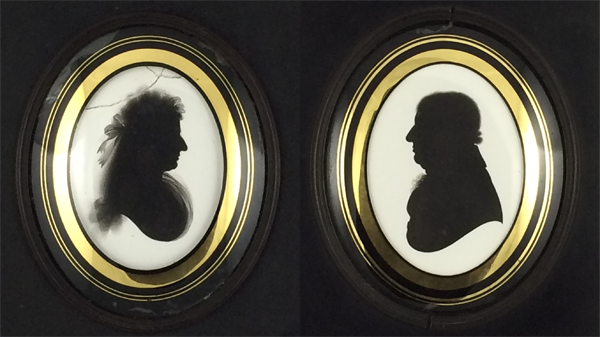 A pair of silhouette by John Miers, who claimed to paint these after a one-minute sitting. 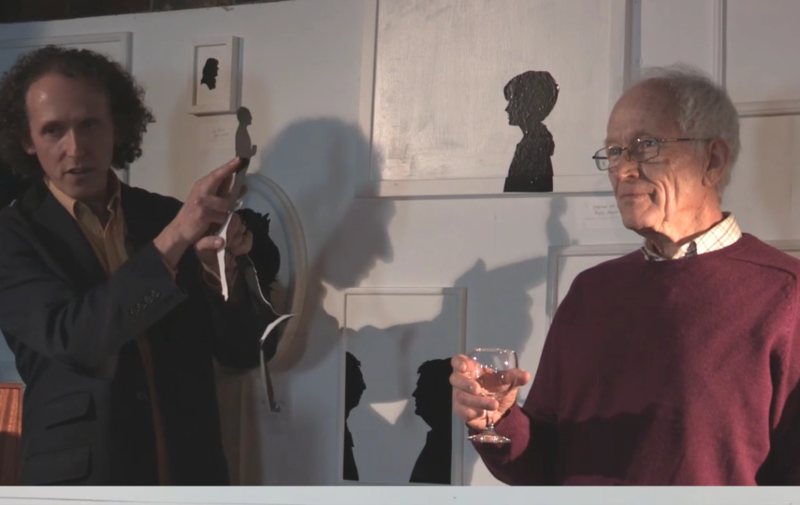 His silhouettes were painted onto small plaster slabs, using a mixture of beer and soot! My talk will consist of stories about notable silhouettists of the past, such as that of the French immigrant August Edouart, a refugee from the Napoleonic wars, who brought the French word “silhouette” into the English language. (I find myself wondering, what would he have made of our current debate over membership of a European Union?) It will be illustrated by my own interpretations of these artist’s work, cut on the spot as I speak and using an audience member as a model. Optionally, I can bring a small exhibition of antique silhouettes – or even illustrate the talk with slides – however, the emphasis will be on the stories themselves and the silhouettes I can make on the day. Just thought I would let you know that I have done a link to your site in my latest blog. Thank you James, great blog. Hope to work with you again soon!